home Home arrow_right Forums arrow_right Pmc arrow_right Events arrow_right Color War Skin contest! 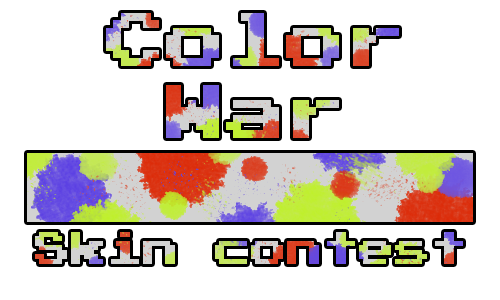 Come one come all to the Color War Skin contest! Everybody joins a team and the team with the best skins win! Join Team Yellow to use yellows and greens, or team red for reds and oranges, or maybe team blue for blues and purples! Challenge yourself, and most importantly have fun! You cannot join a team when they have at least 2 more participants than any other team, EX: Red has 5 and blue and yellow have 2 & 3, you can only enter blue or yellow. You cannot join a team when they have at least 3 participants more than the lowest team. Handicaps - If you feel your skills will make the competition unfair, you can request a handicap, after the judging process if I feel your skin is affecting the score too much I will subtract 1 point in each category. You must make it clear you want one and they are not required. But if you've won tons of competitions and feel others should get a turn, feel free to mention it to me. Judging Criteria - Judging will be based on 10 points for use of color (you get less if you add colors you can't use), 5 points for technique (shading and overall looks), and 15 points for creativity and originality. All the skins on the team will have their points averaged. There will also be 10 points for team spirit, that will be put to that, totaling 40 points per team. At this moment I am going to be the only judge but if you have judged for one of my contests or been asked too before you can feel free to ask. Prizes - As I can't tell how many people each team will have, It will be simple, A team-colored trophy for everyone in the winning team. Participation trophies for everyone, and a simple podium render of the winning skins (The whole team) The most spirited player and top skin overall will get a special pixel trophy as well. Deadline - All skins are going to be due by May 18th. If you know you won't be here in may, do it in April, I have ZERO tolerance for late entries as I give a long period for skinners, HOWEVER, if I haven't started the judging yet, you can PM me about it. Questions - Ask all questions by DMing me or commenting. If you need clarification on a rule, PLEASE for the love of notch ask before doing it. I've had disqualifications before because of this. I finished my Blue Team entry! https://www.planetminecraft.com/skin/hands-on-fire/ Here's my entry! I believe the dark red might not be in my range but it's still mostly yellow's spectrum! heyo, could I join red? Can I join the Blue Team? OK, I'll get started on a skin then! Now we have a molten earth elemental, a sea god, and a sun god. Lord help me, I can't stop! Can i join in? i would join blue but it says closed so it doesn't matter i guess. just make sure it has something to do with black plz its my fav color to work with. May I join yellow? I need my fav color, Lime green! Also how would I send the skin to publish it? Click the Skin tab above, then click the big upload Skin tab , upload your skin and fill out the text and tag bits, then publish. Then visit your Skin and copy the web address, then post it here. Ok umm... can I go blue team? If not red works, too. Never make multiple choices :D if you go with first choice, then second choice wins you end up pondering what if, I've been there lol. Great job on the magma skin! Funny I saw you on this post lol. can i join red team please? Can I be on red team? ?